Astoria Bank, previously known as Astoria Federal Savings & Loan Association, is a bank headquartered in Long Island City, New York. The bank’s holding company, Astoria Financial Corporation, has assets of $16.5 and a total equity of $1.5 billion. The bank primarily serves the metropolitan New York City area. Astoria Bank provides both consumer and business banking solutions. Aside from checking and savings accounts and debit and credit cards, branches provide additional services such as foreign currency exchange, money orders, wire transfers, and safe deposit boxes. There are various tiers of both checking and savings accounts depending on the amount of money invested. As investment increases, additional features are included. The basic accounts for both are slightly anemic, but there are no monthly service charges. Additionally, customers will receive a one-time $50 cash bonus upon hooking up direct deposit from their employer. Credit and debit cards are offered through Visa. There are several credit card programs, including a standard points-per-purchase card, a platinum edition of the same, and a special card for those with bad credit that reports their purchases and payments directly to credit bureaus to help in getting credit back on track. Fraud protection and security is available for all cards. 15-Year Conforming: 3.000% interest, 3.217% APR, $6.91 cost/$1000. 15-Year Jumbo: 3.125% interest, 3.343% APR, $6.97 cost/$1000. 30-Year Jumbo: 3.875% interest, 3.999% APR, $4.70 cost/$1000. 30-Year Affordable Housing Program: 3.625% interest, 4.204% APR, $5.09 cost/$1000. SONYMA Achieving the Dream Program: 3.875% interest, 4.020% APR, $4.70 cost/$1000. Adjustable rate mortgages are also available. Interest rates for savings and checking accounts, CDs, and various other deposits can be seen here. Astoria Bank offers a variety of investments and insurances, but, due to their limited size and capital, this does not seem to be a major part of their business, which mostly revolves around day-to-day banking and lending. Online banking is available free of charge with Astoria Bank. Customers can can check their account balances and transaction history, transfer funds between eligible accounts, view check images, set alerts, and pay bills electronically. These functions can also be performed through text message and mobile apps for Android, iPhone, and iPad. 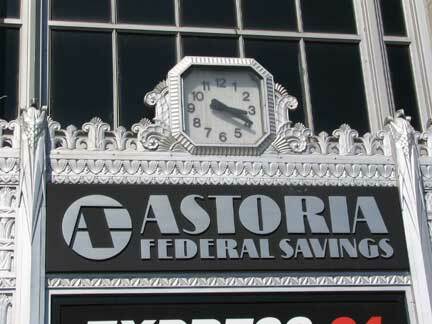 Astoria Bank has 86 branch and ATM locations throughout the greater New York City area. An online location finder is provided, and customers can also use the mobile app to find a nearby location via GPS. The location finder is slightly confusing, making no difference between branches and ATMs at a glance, but further details can be gathered by clicking on each location and then the Branch Hours or Contact Branch links. 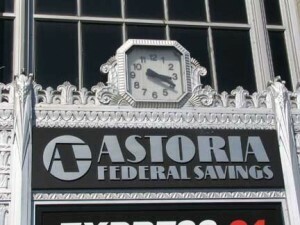 Astoria Bank branches have variable hours, but most are open from 9AM-5PM on weekdays, with some days open until 6PM or 7PM, and 9AM-12PM (noon) on Saturdays, with some locations open a few hours later. The customer service number given on the Astoria Bank website is 1-800-ASTORIA (1-800-278-6742). Questions related to credit cards can be directed to 1-888-295-5540 and callers from outside the United States can call 516-327-7200. Since there are not many locations and it serves only a single city, there is a limited number of customer reviews for Astoria Bank. What reviews are available, however, are mostly negative. They received a 1.2 star average from Consumer Affairs and a 2 star average from MyBankTracker. Complaints mostly revolve around long waiting times, unfair overdraft fees, and strict paperwork regulations. Many customers did have a positive experience, however, meaning the problems may be relegated to certain branches. The mobile banking app is highlighted as a positive.